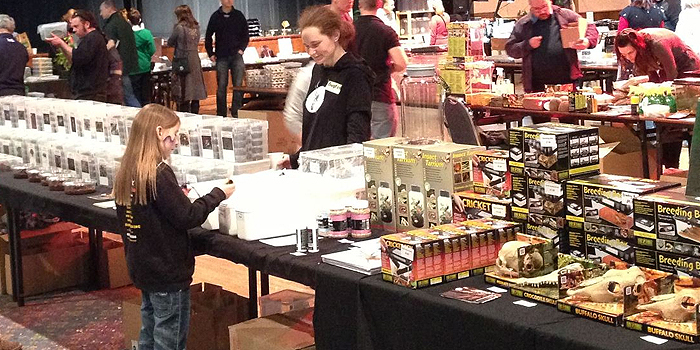 We attend many shows throughout the year all over the UK with a variety of Tarantulas, assorted insects and drygoods. We love shows and support as many as possible as it’s a great way to meet up with regular customers and new. Some are bigger than others and usually the bigger the show the more tables we have but are all worth visiting as not only can you pick out your own spiders you also meet a lot of like minded enthusiasts. Please note these dates and venues where correct at time of publishing. On the odd occasion the date and venue may change and sometimes shows are cancelled. We recommend checking our facebook page or blogs for any updates. An Entomological show with lost of major dealers, a few shops and lots of fun things for kids to do. An Entomological show so has most livestock suppliers as well as deadstock and related equipment. The Biggest Tarantula event of the year, nearly every trader and breeder will be there plus competitions and free lectures. The biggest exotic animal show of the year with anyone who’s anyone is there. This includes most major reptile breeders, manufacturers, Magazine publishers, pets shops etc. There are also lots of Tarantula and Insect suppliers. The AES first held an annual exhibition in 1939, since then the exhibition has grown in to the largest entomological fair in the UK. The exhibition is held at Kempton Park Racecourse during the autumn each year. Our Annual Exhibition and Trade Fair hosts a mixture of societies’ stands and traders selling entomological equipment, livestock, mounted specimens, books and cabinets. The exhibition is the place to buy entomological ephemera, meet fellow enthusiasts and have a great day out. A reptile breeders mating with various captive bred Reptiles and related equipment. There are usual several Tarantula and Insect sellers.